Emergency fire signage plays an important part of your fire evacuation plan. It is essential your business displays the correct type and size of sign that is suitable for the specific environment. Northants Fire can offer the complete service of specification, supply and installation of the correct signage to the latest British Standards. Non-compliance carries risk of prosecution. In determining where to deploy safety signs, employers need to take into account the results of their Fire Risk Assessment made under The Fire Safety Order. These assessments deal with hazard identification, the risks associated with those hazards, and the control measures to be taken. When these control measures have been taken, there may still be a ‘residual’ risk that employees need to be warned and informed of any further measures necessary. Safety signs will help to reduce this residual risk. The safety sign and signal regulations make it clear that safety signs are not a substitute for other means of controlling risks to employees; safety signs are to warn of any remaining significant risk or to instruct employees of the measures they must take in relation to these risks. 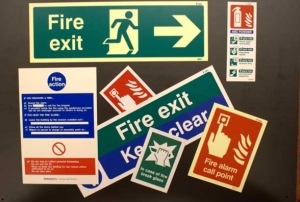 Why not contact us now for an immediate fire safety signage survey?